These videos expose the truth about the dairy industry and the horrors that cows, goats, sheep & their babies endure on dairy farms. Why would farmers place fire up against the udders of cows? This horrible practice, as well as other practices, make the life of cows a living hell. Did you know dairy farms send cows to their death when they are still pregnant? This is without a doubt one of the darkest secrets of the dairy industry. 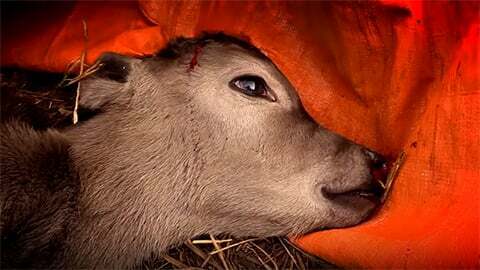 Even though it sounds insane, the killing of calves is essential for the production of dairy and meat. Although it's hard to watch, it's vital we know the truth. Due to our desire to drink the milk of cows, dairy farms tear babies from their mothers for good. Given that cows make milk for their babies, how can we justify this? You won't believe what 4-day-old calves endure on dairy farms unless you see it with your own eyes. Watch what happens to sick or weak female calves soon after they are born at a dairy facility. Even though the dairy industry tries to hide this fact, all dairy cows end in the slaughterhouse. This sad video shows what cow No. 416 had to go through. The abuse of baby calves is pretty much the same when it comes to organic dairy farms. This secret video from a big U.S. dairy farm will make you think twice before eating milk and cheese. Shortly after they took him from his mom, this young calf goes on a quest to reunite with her. The heart touching story of a mother who had her newly born baby taken away from her soon after birth. Watch what the dairy industry does to sick or weak male calves soon after they are born.